I introduced my new blog design yesterday, so it’s time to show off the NEW SHOP! I’m extra-pleased (and sidenote: can we talk about the word “chuffed” for a moment? I’ve been seeing my UK friends using that one all over the place, and it means “pleased,” right? I love that word!!!) with how the shop turned out. It was the main focus of the web overhaul; in other words, the blog makeover was a happy extra, but the real beef of this project was the shop…and I’m so thrilled with how it turned out!!! 1 // Helllooooo Fancy Front Page! You can get to the blog with the “latest post” section. New PDF patterns are just below the nifty slideshow (woo hoo!) and if you’re searching for women’s, children’s, freebies, accessories, it’s all easy to find on the sidebar. You can also search by difficulty on the sidebar. 2 // Each pattern has its own page with multiple photos and tons of information. The little colored buttons indicate the difficulty of a pattern. The MORE tab has a list of the related blog posts so you can see more examples and read more about the pattern on my blog! 4 // You can also find the pattern’s photo pool gallery with user-submitted projects at the bottom of the pattern page. Fun for seeing what everyone else is making! 5 // For products that have more than one size available (like Flashback Tee and Geranium), you can select the size you want (or both!) from the drop-down menu. 6 // Bundles — like the Charlie Bundle and the Washi Bundle have their own listings. 7 // Many will be happy to know that we now take credit card payments in addition to Paypal! I’m sure there are more features that I’m forgetting, but at least that gives you a little tour! Do you like it?? One decision that I made (pretty early in this project) was to keep the BLOG at the main made-by-rae.com URL, and put the SHOP at shop.made-by-rae.com. It has become pretty standard when you sell anything on the internet to put your shop at the main URL and then put the blog off to the side, but I didn’t want to do this. My blog is the heart and soul of what I do and I want that to show. Maybe that’s a poor business decision on my part, but…the patterns are great but they’re just a way to support my true passion which is sewing for myself and my kids. Having a business can be — quite frankly — a bit of a drag (all that bookkeeping! quarterly taxes! expense/income analysis! accounting fees!! NEED I SAY MORE? ), so while I do almost constantly dream about new patterns to put in the shop, I still spend plenty of time gazing at my fabric stash and sketching new things to sew. All this to say…I decided to keep the blog at made-by-rae.com instead of sidelining it…probably didn’t need a whole paragraph to say that but…OH WELL! Thanks for stopping by to see my new shop! I want to give a HUGE thank you to Aeolidia, and especially Christine and Shoshanna for me to helping execute what I’m sure was a much more ambitious project than anyone anticipated. The folks at Aeolidia were kind, patient (I did go and have a baby about halfway into the project, so that slowed things down considerably), and a true pleasure to work with. I highly recommend them if you are interested in taking a website/blog/shop to the next level. I also really need to thank my lovely coworkers Jessica and Elli for all of the hard work they put into updating the new blog and shop as well! Finally…you can find me on: Instagram, Facebook, Pinterest, and Twitter. I love your shiny new blog! I still enjoy the longer format and photo-heavy experience of blogs over Instagram and other platforms. But feeling in the minority. I have been thinking “what’s next?” too. However blogging evolves it seems photos are king, right? Would love to discuss over lunch with you and some bloggy friends. If only…. woah it looks fantastic, rae! i need to hire your people. you guys did a great job. Dude, awesome to see the transatlantic vocab flowing in your direction. And you should be chuffed. Well chuffed, indeed. As am I that I can buy patterns without paypal. I’m going straight to that shiny shop of yours now! The new blog looks great. 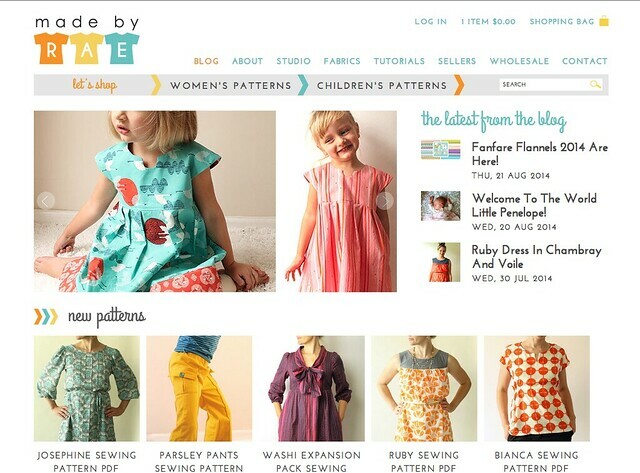 We went through a major site design for patternreview so I know how much work this is. On my screen in Chrome, some elements are overlapping. I’d like to send you a screenshot if you’re interested. Where should I post it? I dont think I can attach it here. I have a jpg file. Just sent you an email, Deepika! PS: The shop site isn’t just pretty, it’s slick! I just ordered a few patterns. No paypal. Easiest thing in the world. Swish and onto my laptop. Very excited. Now I have a Charlie to celebrate my boys and a Ruby and a Bianca to celebrate me um twice, haha!. I love your blog (and you new shop) and I’m so happy to read that you are keeping it front and center. It was your blog that drew me in – the patterns are just a great side perk. I love reading about your creations, especially sewing for your sons since I have two of my own little boys. It’s superfun to be inspired by what you create for them! I love it! The colors and design are fantastic. I also really love how you added a link to the photo pool of other versions so you can really see what finished products will look like in a variety of different fabrics. Congrats, Rae. I am really happy for all your success and for you to be from Ann Arbor and have the opportunity to sew with you once a month is a real treat! Oh my goodness! You really know someone named “Shoshanna?! That is awesome. Your site looks great too!